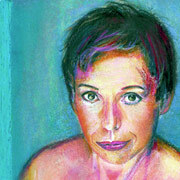 Barb Jungr comes across as very chatty jolly lady; your best friend’s talented mum. This easygoing manner doesn’t apply when it comes to delivering her songs. In this show Barb, accompanied by Simon Wallace on piano, has a wonderful knack of bringing new depths of meaning to songs you already love and think you know. Take the Monkees song, I’m a Believer. Barb’s interpretation wrings every syllable of pathos from what is normally just hum-along background wallpaper. It’s electrifying. This pure, simple entertainment is a condensed version of her new album, The Men I Love. These songs cover the whole gamut of reality: love, hope, dashed expectations with covers of songs by Bruce Springsteen, Gram Parsons and the place where Barb goes for redemption, Leonard Cohen. If you enjoy the show, and you’d have to have a heart of stone not to like it, you can get the chance to buy a CD afterwards.